TAMPA, Fla. – Marshall's bowl tradition is something the football program treasures. Fittingly, the postgame presentation after Thursday's Bad Boy Mowers Gasparilla Bowl involved the presentation of a trophy that looked like a pirate's chest of riches. The Thundering Herd, in front of a national television audience, protected its bowl reputation with a dominant 38-20 win against South Florida here at Raymond James Stadium. Marshall, with the best winning percentage in bowl games (12-2, .857) among teams with at least five appearances, extended its streak of consecutive bowl wins to seven and improved to 6-0 in bowl games under Doc Holliday. "The ones you win are the ones you remember," Holliday said. "There's nothing like that locker room after a bowl game win. Fortunately, we've had six straight that have been happy locker rooms. There's nothing better than that." For his efforts, senior running back Keion Davis was named the Gasparilla Bowl Most Valuable Player. But he was not the only star on a night when football fans nationwide were watching the only bowl game on the schedule this day, and the only notable football game overall with no typical Thursday night NFL game this week. Marshall scored four rushing touchdowns in the first half – one each by freshman quarterback Isaiah Green, senior running back Anthony Anderson, freshman running back Brenden Knox and Davis, who added another to ice the game in the fourth quarter. The Herd scored the first 14 points before allowing a rare first quarter touchdown, and won a game for the 18th consecutive time when scoring first. Davis locked up MVP honors with a 94-yard effort, including a 52-yard run in the fourth quarter. That was part of a 282-yard rushing effort for Marshall as a team, a tribute to the offensive line. Davis eclipsed 2,000 rushing yards for his career, and senior Tyre Brady surpassed 1,000 receiving yards for the season with a five-reception, 88-yard stat line. "We rushed for almost 300 yards," Holliday said. "Knox broke his hand in the first half … you've got to look at that offensive line. Keion is a special player. (The offensive line is) all still young. There's only one senior in that group. They are a bunch of young guys who continue to get better and I'm looking forward to getting them all back." Marshall, which improved to 7-0 in 2018 when leading after the opening quarter, had a record-setting first 15 minutes. 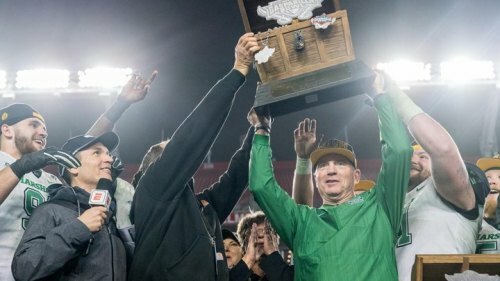 The Herd scored 21 points, eclipsing its total point output from either of its two previous appearances in this particular bowl game (20 points versus FIU in 2011; 16 points against UConn in 2015), and tied the bowl game's record for points in a quarter. The previous record for points scored in the first quarter was 14, accomplished by four teams in the game's 11-year history. All three first quarter touchdowns came on the ground. First it was Green, who engineered a seven-play, 81-yard scoring drive in 3:41 before scoring on a 10-yard run, his first career rushing touchdown. Green was 4 for 4 passing on the drive for 63 yards, and had an additional 12 yards on two carries, and gave the Herd a 7-0 lead with 5:20 left of the first quarter. Another score came 37 seconds later after freshman defensive end Darius Hodge collected a sack and a fumble recovery on consecutive plays. Hodge picked up an errant snap and returned it 29 yards to the 1, and Anderson dove into the end zone to make it 14-0, MU, with 4:43 left of the first quarter. USF scored on the ensuing drive, only the third touchdown an opponent has scored against Marshall in the first quarter this season. On a trick play, receiver Tyre McCants connected with fellow receiver Randall St. Felix from 38 yards out to cut the deficit in half with 2:43 left. But Marshall marched down the field in 2 minutes and 18 seconds, capping a five-play, 80-yard drive with an 8-yard touchdown run by Knox, who gained 65 yards on the ground in the first quarter alone. Knox also had a 43-yard run in the first quarter – the fourth-longest run in Gasparilla Bowl history – but that drive fizzled and ended with a turnover on downs. In the first quarter, Marshall out-gained USF 212-88. The Herd's lead swelled to three scores late in the first half when the offense turned a short field into a quick score when Davis ran through tackles from 5 yards out for his first touchdown since the season opener at Miami. That made it 28-7, MU, with 1:30 left, and USF was able to scoot down the field and kick a field goal with 4 seconds left of the half. From there, Marshall was dead set on keeping its place atop college football's bowl leaderboard and keep Holliday blemish-free in six bowl appearances. Holliday also became the school's all-time leader in bowl wins, getting his sixth in the last eight seasons. USF, down by 21 late in the first half, trimmed the lead to 11 points, 31-20, by the end of the third quarter thanks to St. Felix, who set a Gasparilla Bowl record for receiving yards and scored again in the third quarter. But Marshall blanked USF in the fourth quarter, dominating time of possession and relying on its group of runners to put the game away. In addition to Davis, Knox finished with 93 rushing yards on 12 carries. Anderson added 43 yards on the ground, and Green had 36. Defensively, Frankie Hernandez led the Herd in tackles with eight playing in front of his hometown crowd. Defensive tackle Channing Hames, the 2017 New Mexico Bowl Defensive MVP, had two of the Herd's four sacks. USF's dynamic one-two punch in the backfield, Jordan Cronkrite and Johnny Ford, combined to rush for 76 yards on 22 attempts, and the Bulls averaged 2.6 yards per rush as a team.